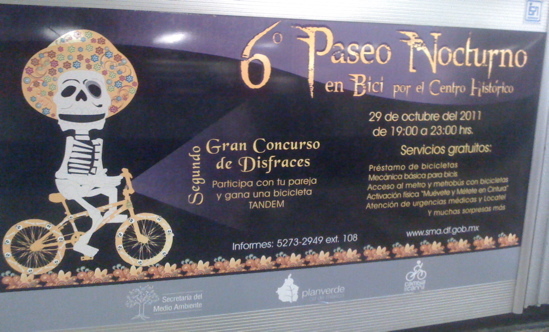 I made a trip down to Mexico City this past week, and wanted to highlight a bit of what I saw in terms of bicycling. 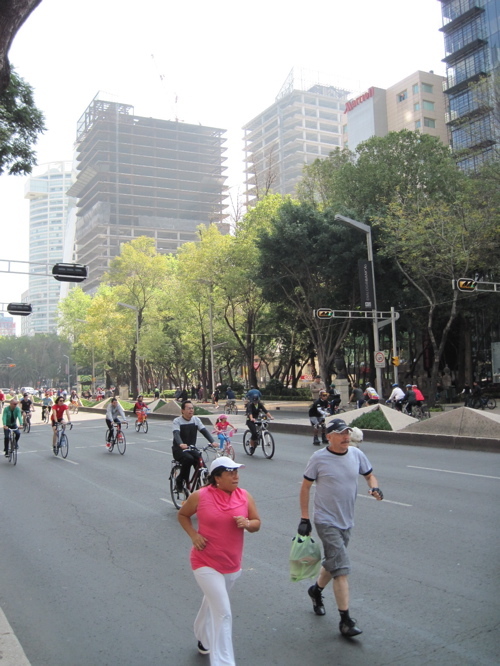 On Sundays, they close off a portion of the biggest avenue in the city, Reforma, and until 2pm open it to bikes, runners, rollerbladers, etc. 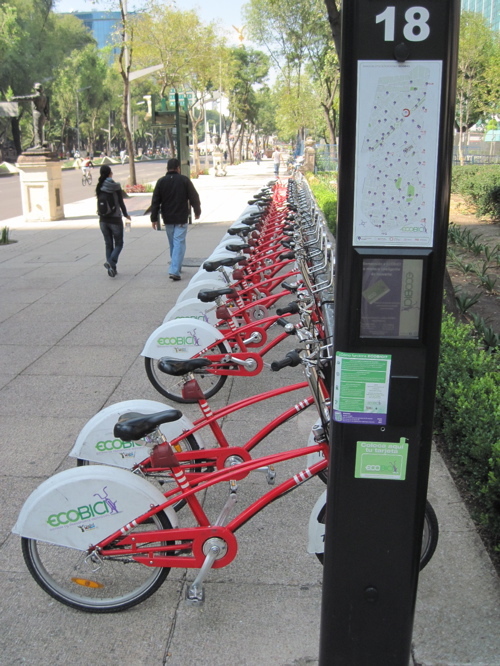 There are numerous bike share racks along the avenue. And it appears they have racks set up in quite a few places around the big city. 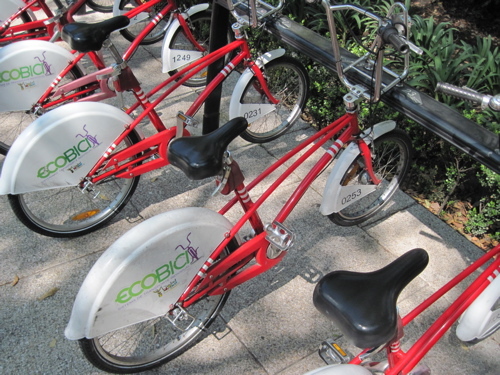 Here’s a closer look at one of the Eco-Bici machines. At one end of the avenue, they set up an ‘urban cycling school’ to help folks learn to ride. 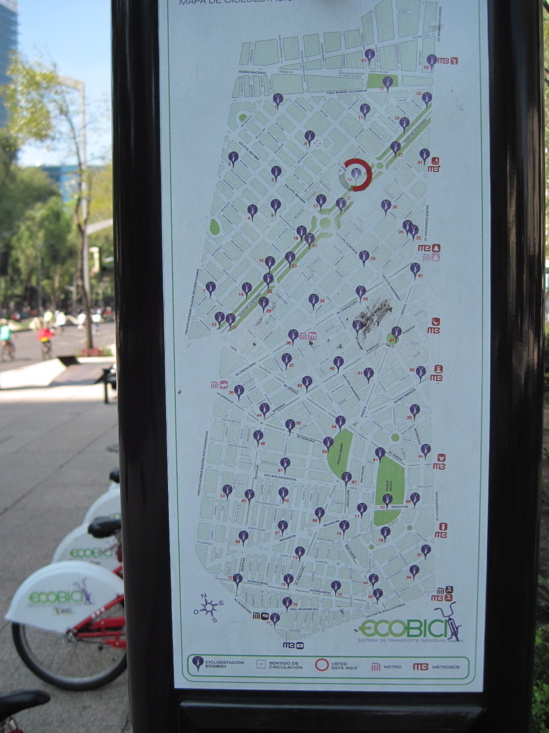 I saw a fair number of painted bike lanes around town, but Mexico City riding looks daunting to me – lots of cars, lots of intersections without stop signs where the most aggressive drivers just shoot through. 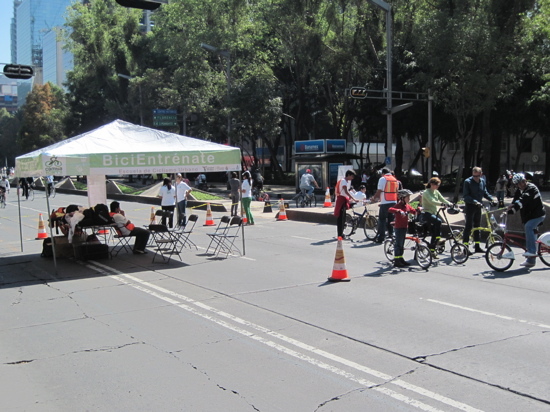 But I did see some riders braving the open streets, including one guy riding against traffic in between lanes!!! Anyway, looks like there are also some big organized rides. 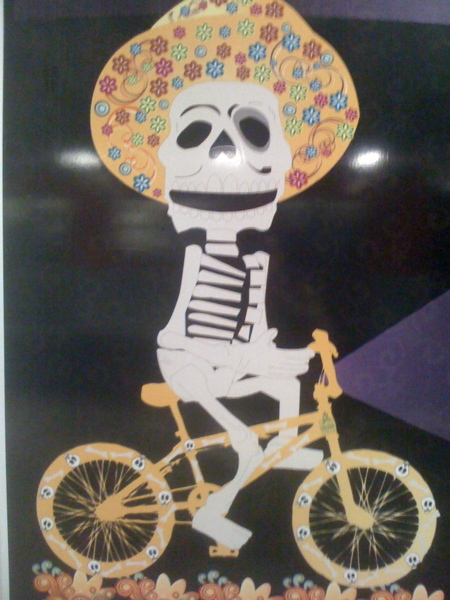 This billboard was up in one of the Metro stations (cheap and frequent service), for a Halloween/Day of the Dead evening ride on Oct. 29. I was lucky to be able to spend 10 days on the big island of Hawaii over Christmas – missing the biggest snowstorm in Portland in some 30 years! Weather in Kona is generally very predictable and enjoyable. Here are a few views from the lanai, showing some of the various views we had there. A few weeks back I was in Berlin for a quick weekend visit, and one of the things I saw there was the Jeff Koons Celebration show at the Neue Nationalgalerie (a famous modern building in its own right, architect Mies van der Rohe). The show consists of 11 large pieces, spread out around the ground floor. No photos were allowed inside, but I took a few from the windows. I couldn’t get a good shot of the one I liked best, which can be seen above in the background – the tulips. (I do kind of like the way I got the two walking feet below the heart above – just a coincidence!). In this show I was reminded of Warhol’s comment about being all on the surface… these pieces are all surface as well. Most of them are big and shiny and hollow, nothing inside. But who doesn’t like big shiny things? How often do we find that the anticipation of the wrapped present is sweeter than the gift inside? After the show I saw this ‘waving cat’ in the window of a souvenir shop, and it seemed to fit the same aesthetic – I wish Koons would make a big one of these! Following my annual visit to Las Vegas, I made the three hour drive over the Zion National Park in south-western Utah. As it turned out, it was a great time to be there – not many visitors, beautiful fall colors, great weather. On the first full day I climbed up about 1400 ft from the canyon floor to the top of Angel’s Landing. Above the main canyon is behind me. In the next shot I’m looking back the other direction, up toward the ‘Narrows’ of the Virgin River. Then the next day I rented some gear and hiked up The Narrows, where at times the rock walls tower over 1000 feet on each side, and the river is not more than about 20 feet wide. Here are a few more shots – as you can see, on a gray day things can look a little bleak. I found the lack of trees in some areas to be a real downside. But this area of the Begijnen was very lovely. This area was created by women who had lost their men in the Crusades, and they took a vow of chastity and lived within the walls of this area. Just back from a quick weekend visit to the ancient Belgian town of Bruges, also known as Brugge. 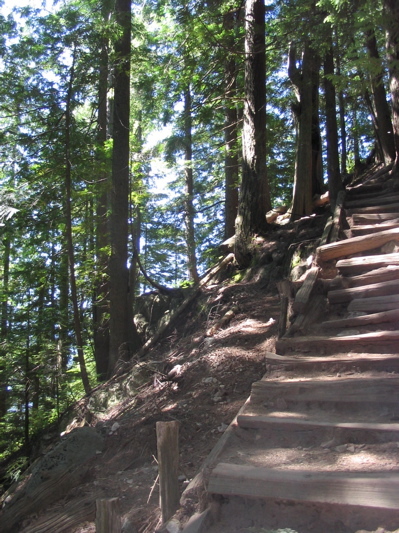 I got pretty lucky with the weather – as you can see, a nice sunny day on Saturday. Above is a shot of a canal near where I was staying. Next is a shot taken in the main square, known as the Markt. Here a couple more picturesque scenes – the town abounds in them! Bruges was apparently at its peak back in the 1300 and 1400s, then faded in importance for quite a long time. These days it’s a very well preserved tourist attraction. Later I’ll post a few more shots from a bit further off the beaten track. After the Bauhaus visits, I took a little wander around the town of Dessau. Here I found more obvious traces of some fairly brutal architecture from the Communist years. I can’t object to the goal of providing decent housing for people. but these places just clearly aren’t loved by anyone anymore. After the rigorous straight lines of the Bauhaus school, on the same day I paid a visit to Die Grüne Zitadelle of Magdeburg, the last completed architectural project of Austrian artist Hundertwasser. One of his main tenets was the rejection of those straight lines! I took a tour, but it unfortunately didn’t spend too much time inside the building. The hallway floors have a tendency to rise up in the corners and edges, and most every surface gets rounded off in some way. There are obviously some correspondances with what Gaudi was doing in Barcelona a hundred years back.